Games are young and naive, so they hang out with older boys – movies – to be cool. They smoke and nod sagely at whatever movies do, aping their moves, desperate to be mistaken for one. And they’re just too star-struck to see their idols are mainly bloated, frantic and sad. Black Rock are one of the few developers to see that games’ similarities to film are over-stressed – it’s the differences that make them more powerful than anything. For instance, in reality you can’t throw a battleship at a car. In films, you can throw battleships around, but it’ll cost a fortune. In games, however, it’s as easy as filling the screen with anything else. All you need is the imagination to make it happen, which is where Split/Second excels. So in Split/Second, you’ll topple colossal towers and then career up the remains, raze office blocks and cooling towers, and race along sinking aircraft carriers. You can also cause helicopters to drop bombs and make cranes sweep earth-moving machinery across the road to crash the other racers, although it’s remarkably cheerful for such extreme violence. There are no human figures, so no ‘deaths’ here… After all, it’s published by Disney, a company with its primal lust for blood so firmly in check that it can televise Miley Cyrus. Handling is like Burnout, only not as good. It’s close, but the steering is a little thick and the responses of even the most mental cars is too sluggish. More damningly, it’s often quicker not to drift, and impacts are curiously lifeless given the destruction all around. But then, while we lost a fair few times – usually right on the finish line, which is just annoying – we hardly ever crashed. It’s not catastrophic, just a little limp. Shame, because Split/Second solves several thorny design problems in one go. It’s basically racing with weapons, but without the control nightmare of aiming a car and gun at the same time. It also moves on from the ‘drift to earn boost’ standard. Here, you drive madly to earn ‘power plays’. Press the button and something blows up or collapses. Time it right to wave sayonara to your esteemed competitors. Get the gauge into the red and you can activate mega-events, such as the launch of a battleship, in a few designated spots on each track. But you must also save some power in order to activate the shortcuts that need opening on each lap. This should all add up to something quite tactical, but we rarely knew what we were about to blow up or where our rivals were in relation to it. We just blew up everything we could. Inevitably, it works online if you think a child racist is what this needs, but there’s also a split-screen option for those old-fashioned enough to enjoy physically assaulting players acting like dicks ‘at source’, as it were. How quaint. 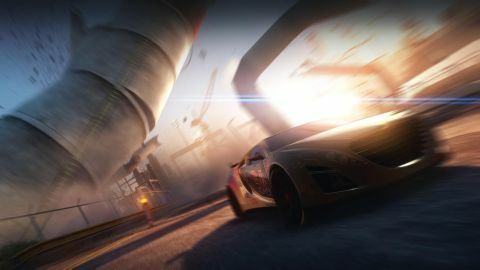 The barrel dodging Survival minigamehas all the score-chasing, ‘one more go’ hallmarks of Burnout’s infamous crash junctions. There is one part of the game that steals the show: the Detonator round, where you surge past explosion after explosion, like a Hollywood stunt driver, barely sneaking through licks of flame and feeling like a total action hero. We wish there were more of these levels, as they really show how Split/Second can shine. So. It’s messy fun that slightly under-delivers. The episodic, reality TV conceit feels tacked on (with the sound turned off, you’d mistake it for a standard racer), but thankfully it’s so flimsily attached that it’s irrelevant and spoils nothing. Consequently, Split/Second is better than Hollywood, less impressive than Burnout and more amusing than both of them. It’s messy fun that slightly under-delivers. The episodic, reality TV conceit feels tacked on (with the sound turned off, you’d mistake it for a standard racer), but thankfully it’s so flimsily attached that it’s irrelevant and spoils nothing. Consequently, Split/Second is better than Hollywood, less impressive than Burnout and more amusing than both of them.